Every reader has a preference, an opinion, and a view point that makes them a critic in their own right and yet it impresses me the way in which good poets draw audiences in by virtue of their truth presented in its purest form. Romp and Ceremony doesn’t disappoint. It’s from Jeannie Robert’s perspective that the reader is invited to ponder, discover, and relate to her poetry through its relevance written with a healthy twist of witticism that keeps readers on their toes. When we look inside our own mirrors, what would we find? Captivating, emotive, and calling for reflection, Ms. Roberts is not afraid to invite her readers to laugh or to cry but before you decide, she’s not done. Throughout her collection, she adds a healthy dose of playful fun that will leave readers smiling at her cleverness. Consider “Alien Birth,” “Ten,” or “New Year’s Resolution” where Ms. Roberts frets over an aging physique before finding the answer to a youthful appearance through her dog. All joking aside, Ms. Roberts has a gift for describing the celebration of flora as daffodils dance in “Daffadown Dilly” and for fauna as in “Gray Wolf” where she describes heartache sorely felt through the cruelty of man. Contained within her works, Ms. Roberts merges the written word with visual art finding her muse through paintings and snapshots. One such poem, inspired by a photograph, is “Reflecting upon Upper Eau Claire Lake” highlighted through descriptive splendor and appeal. 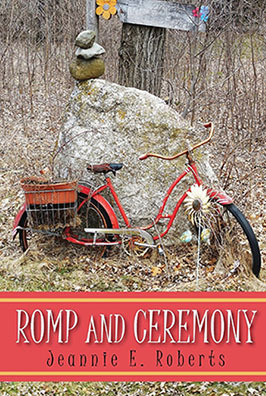 Romp and Ceremony catches its audience well. It is a must read and an asset to anyone looking to grow their poetry collection.